In order to fill the void left in the de-legitimization of the old Expanded Universe, Disney quickly launched a slew of new stories and novels with no apparent expectation of slowing down. Money must be made after all, which is not to say that the content created for that endeavor is no less creatively original or earnest effort goes into its production by the writers and artists involved. Likewise, the new Expanded Universe, with similarity to the old, has identified a shotgun like approach to achieving the aforementioned goal of profitability, hitting all the demographics. Thus, you have novels for adults or readers of all ages, and then you have young adult and even elementary or pre-school level works. 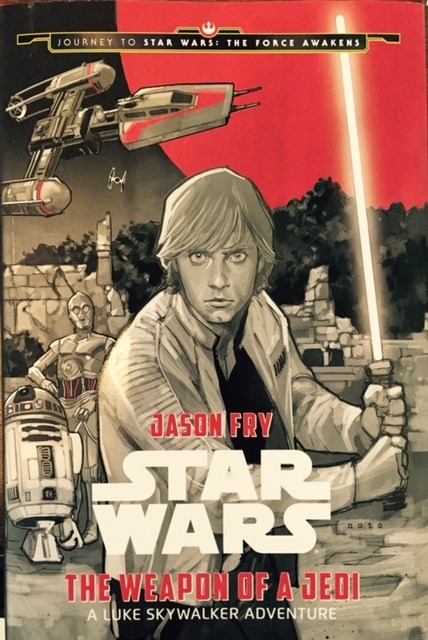 The Weapon of a Jedi, by Jason Fry with illustrations by Phil Noto, falls into the realm of young adult publications. The story encompassed within its 184 pages is that of Luke Skywalker being drawn to the planet Devaron and discovering a ruined Jedi Temple. At the temple, he discovers Jedi training devices and essentially, advances his understanding and ability to wield the Force and a lightsaber. Throughout, we are treated to a Luke who is still hunting for just the basics of what it means to be a Jedi, and for the first time, perhaps, Luke is identified as a padawan by another. It is not a story with major implications for the characters involved, but it is an important one for Skywalker to provide a foundation from his transition from moisture farmer to Jedi between A New Hope and The Empire Strikes Back. The Weapon of a Jedi is also interesting for providing more perspectives on how the Empire was viewed by the planets which subsequently found themselves under its control. Again, we have the Imperial virtue of order as the sole barrier between peace and a galaxy awash with chaos and disorder. Additionally, the propaganda spun by the Empire concerning the Jedi – tainting the peace keepers of a thousand generations as sorcerers and traitors. Then, lastly, the proffered belief that the Empire was simply too powerful and big to be overthrown. Many of the new Expanded Universe additions have touched upon them, which is not surprising given that Tarkin, a biography in part of Grand Moff Tarkin, was one of the first such contributions to the universe from the get go. The Empire’s role and place in the galaxy has been at the forefront of Disney’s take on its galaxy, far, far, away franchise. Ostensibly the same weapon wielded by General Grievous’ elite droids in the Clone Wars, it proves resistant to the cutting blade of a lightsaber. Its noted use here might have been to foreshadow the First Order’s batons, which made Finn’s first duel with a lightsaber feasible. Beyond this, with the peculiar decision to frame the book’s opening and closing as a story told by C-3PO to a Resistance Starfighter pilot, there was not much which indicated many “clues about the highly anticipated new film…” (from the back cover). The writing of the short novel is competent and carries with it the idea that something much more sophisticated once lurked underneath it. It’s a telling which has been simplified for an intended audience, which in a way, is unfortunate as the author, Fry (whom we have never had the pleasure to read before, has written extensively on Star Wars and contributed other works to the expanded universe), appears to be quite capable of writing an adventure that offers even more nuance and depth than the format allowed. The author definitely has an excellent grasp of what makes Star Wars interesting and entertaining, be it the mystical qualities of the Force to the struggles of a young Skywalker to master his destiny. For what the novel is and its intended audience, The Weapon of a Jedi is a fine contribution to the Expanded Universe. In a perfect world, it would be one story amongst a printed compilation of stories of similar length. It probably is not necessary to read if one is not consumed with a need to read every new addition and know every step of our heroes’ journeys,, but if one makes the decision to pick it up, they will find a light read with enough fun and insight into Luke’s post-Obi-Wan training to make it worth while. Not to be forgotten, there are a number of illustrations by Phil Noto throughout the books. They serve more as section or chapter placement and are printed in a gray scale format. They are also quite nice and enjoyable to glance at as the story proceeds. Also, when it comes to envisioning Sarco, they go a long way toward helping the mind shape the words written by Fry. They are a nice addition to the story and the illustrated Star Wars universe.